What should you eat the day of the competition? Check in at a Festivus Games Host is commonly about 8am. The Athlete briefing may be closer to 9am. However, always check with your Host to see if they are using different check-in and briefing times. We recommend you behave as close to what your norm is as possible that morning. We realize everything from your sleep to wake-up time may be totally jacked with travel and nerves to consider. If you’re used to eating high fat, lower carb now is not the time to change. If you’re using to eating lower fat, higher carb now is not the time to change. If you’re used to eating moderate fat and moderate carb guess what we’re going to advise? Consuming some healthy fat (coconut oil, olive oil, macadamia nuts, perhaps a little ghee) if that is what you normally eat is still smart as part of your breakfast. In addition clean protein is advised (eggs and/or grass-fed and/or pastured and/or free range whatever) as always. Last but NOT least is having some carbs. We aren’t rabid paleo freaks but we do adhere to it mostly. We believe that, like ancestors thousands of years ago, from various parts of the globe, some single-ingredient grains are fine (i.e., rolled oats, brown rice, quinoa) as is some whole, unsweetened fruit. So at the practical level we might advise having a couple whole eggs with additional egg whites as you see fit cooked in coconut oil and 1-2 cups of whole grain cooked. And, again, depending on what you are used to, we’d recommend having your generous breakfast no later than about 6am. The length of a Festivus Games competition day will vary by Host and the number of Athletes competing at each Host. It’s common for the competition day to last from 8am until about 5pm. It’s also most common for Athletes to perform three challenging WODs usually lasting 10 or less minutes each with a tougher finals WOD only for those in the top five of their division. We’re all nervous most of a competition day and the last thing we want on our stomachs before a super hard, gasser of a workout is a bunch of food or anything heavy. We realize as soon as we say this you’ll be able to tell stories of yourself or friends who eat 1500 calories of whatever 30 minutes before they train. We get it. But that’s not what we suggest and it’s not what most do. But if that’s what you do routinely and it works for you? More power to you – go for it. On the day of competition, contrary to some popular misconceptions, it’s not a day you need to worry yourself sick about protein. Protein is a poor energy source. It really can’t be stored in the body. And it’s inefficient at delivering usable energy for high-effort activities. This is not to say that you should avoid protein. But bringing a bucket of chicken breasts with nothing else is foolish. We recommend you bring some protein and that you do so in forms you are totally used to eating. As we’ll repeat now is NOT the time to try new things! So bring maybe a couple baked or grilled chicken breasts or thighs seasoned with some sea salt and whatever you’re used to. We recommend yams over sweet potatoes due to their higher potassium content. Next in line we recommend a single-ingredient whole grain like brown rice, oatmeal or quinoa over fruit because high-fructose carbs may upset the gastrointestinal tract more and they may not be as good as grains for delivering glucose to skeletal muscle. We’re not against packing a little fruit in your cooler. We just don’t recommend it as the primary carb on competition day. Again, stick with the foods and type of eating you are most used to. Our recommendation on fats for competition day is to bring some roasted/salted macadamia nuts. The fatty acid spectrum of macadamia nuts is really tough to beat in the nut family. Athletes will commonly bring some version of a trail mix too. Again, if you’re used to it and you know it works for you – go for it. Stick with what you know. Hydration is critical! Even a two percent dehydrated state can reduce performance. Drink mostly water but perhaps 20ish ounces of Gatorade total throughout the day wouldn’t be bad either (for the electrolytes) if it’s a hot, extra sweaty day. The rest of your fluid intake should be water. Our competitions are in April and October so you’re gonna sweat but it’s not like you’re gonna be doing a triple “Murph” in 100 degree heat for two hours straight. In all plan on drinking one-half to one full gallon of water spread out throughout the day. Many Hosts provide bottled water but don’t count on it – bring your own. What About Shakes and Bars? Shakes and bars can be convenient. Over the past several years more and more of them are being produced with cleaner, less-processed ingredients. Here are links to a few brands that have decently clean ingredients: About Time, Rx Bar, Exoprotein bar, Julian Bakery bar and Larabar. If you’re used to drinking shakes and eating bars then we, again, will say stick with what you know works for you. Don’t go buy some shakes and bars though for use on competition day unless you’ve thoroughly tested them. There might not be enough porta-toilets available and you never know how you’re going to react until you try them. Assuming you’ve already had breakfast we recommend you eat a little bit right after you finish a WOD. You will probably have 60-90 minutes until your next WOD but check with the head judge or staff or find the heat sheet and know your scheduled WOD times throughout the day. Some Hosts are super efficient and may have you doing your WODs about 30 minutes apart! Eating after each WOD and keeping hunger to a low roar throughout the day while staying consistent with your hydration will keep you fueled and feeling good. Celebrate! You worked hard. You accomplished great things. You learned some new things about yourself and probably set a PR or two. Of legal age and want to drink? Fine! Feel like having a pizza? Go for it! Whatever suits you this is your time to unwind and refuel. 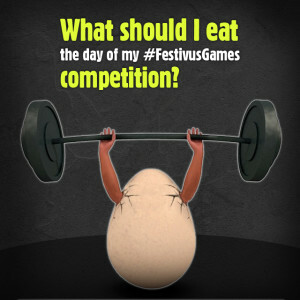 We hope you have a fantastic time at your Festivus Games competition! 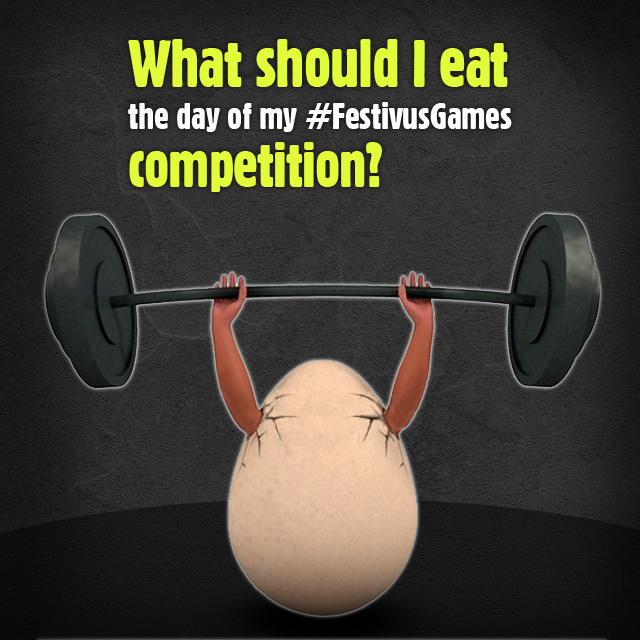 We’ve tried to include the guts of what we do ourselves and recommend to others competing in Festivus Games. When it comes to eating the day of a competition you will find some trial and correction is in order. The more you do them the better you’ll get at figuring out what’s right for you, what’s too much, what’s not enough, what works and what flat out doesn’t.